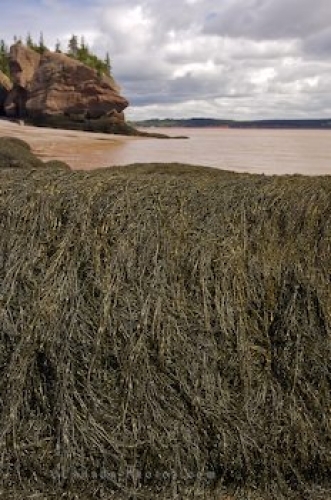 Along the beach at the Hopewell Rocks in the Bay of Fundy in New Brunswick, Canada kelp covers the rocks and is clearly visible at low tide. When the tide is out, the beach and the scenery around Hopewell Rocks in New Brunswick, Canada is stunning as massive rocks have been carved by the tides and the kelp blankets the coastline. When the tide comes in, the kelp beds will be covered until the next ocean tide when the kelp will once again be bared. Picture of kelp that clings to the rocks at the Hopewell Rocks in New Brunswick, Canada.